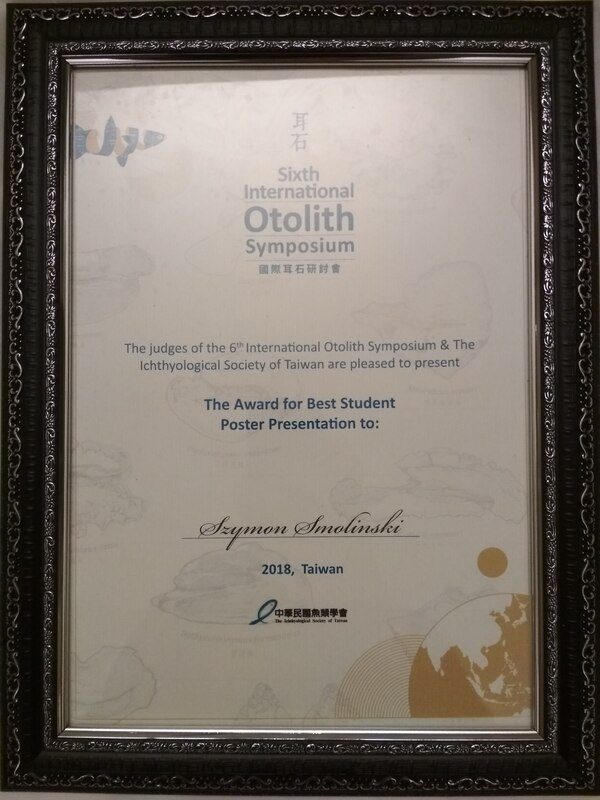 During the 6th International Otolith Symposium, which was held during 15–20 April 2018 in Keelung, Taiwan, Szymon Smoliński, our employee from the NMFRI Department of Fisheries Resources, was presented with the Award for the Best Student Poster Presentation by the judges of the 6th International Otolith Symposium and the Ichthyological Society of Taiwan that assessed the substantive value of the work, the way the results were depicted and the enthusiasm of the presenter. The poster showed the results of research on the population structure of the central Baltic herring. Identification of fish populations is essential for reliable resource management and is now an integral part of a modern resource assessment. The presented studies used the analysis of the shape of otoliths and the comparison of the growth rate of individual fish groups. The results confirmed the opinion on the intense mixing of herring with different biological characteristics in the Baltic Sea, indicating the high importance of this phenomenon for the proper management of fish stocks of this species.